"Let's get this straight—ghosts are everywhere. And they're dangerous. This is why my family has hunted them for hundreds of years." The Marin family run a two-man operation in inner-city Melbourne. Anton has the ghost-sight, but his father does not. Theirs is a gentle approach to ghost hunting. Rani Cross, combat-skilled ghost hunter from the Company of the Righteous, is all about the slashing. Anton and Rani don't see eye to eye—but with a massive spike in violent ghost manifestations, they must find a way to work together. And what with all the blindingly terrifying brushes with death, Anton must use his gap year to decide if he really wants in on the whole ghost-hunting biz. 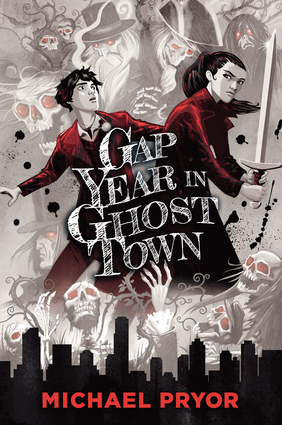 Gap Year in Ghost Town is smart, funny, and scary—with extra action and attitude. Michael Pryor is one of Australia's premier science fiction and fantasy authors. He is the author of more than 35 books, including Blaze of Glory and Machine Wars, and 50 short stories. Michael has been shortlisted seven times for the Aurealis Awards, and seven of his books have been CBCA Notable Books.